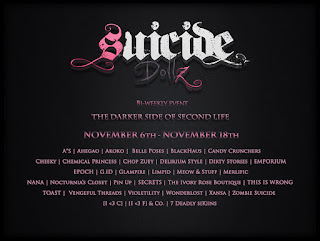 Come explore the newest round of Suicide Dollz Now until Nov 18! 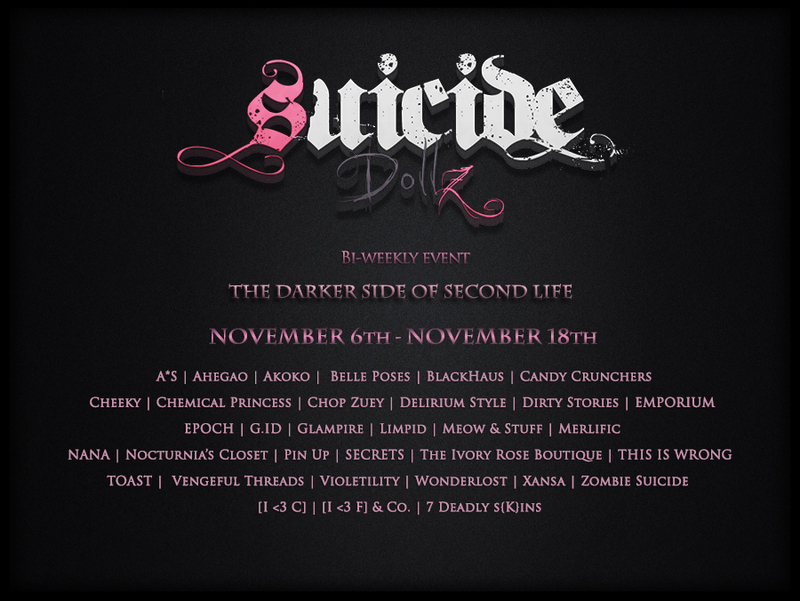 Check out the Suicide Dollz event's newest round from 1PM SLT November 6th until 1PM SLT November 18th. As Second Life's longest running, alternative themed, bi-weekly shopping event, established in 2013, we continuously strive to bring you the best products by some of the grid's most recognized designers. To check out our full, uncensored shopping guide for the current round, please visit https://suicidedollzsl.wordpress.com/. The current round will run for two weeks before closing on Friday, November 18th at 1PM SLT. For any questions, please send a NC in-world to Selene Starflare or email to selenestarflare@gmail.com.